Today’s data centers are expected to deploy, manage, and report on different tiers of business applications, databases, virtual workloads, home directories, and file sharing simultaneously. They also need to co-locate multiple systems while sharing power and energy. This is true for large as well as small environments. The trend in modern IT is to consolidate as much as possible to minimize cost and maximize efficiency of data centers and branch offices. 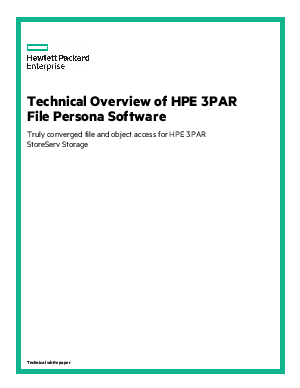 HPE 3PAR StoreServ is highly efficient, flash-optimized storage engineered for the true convergence of block, file, and object access to help consolidate diverse workloads efficiently. HPE 3PAR OS and converged controllers incorporate multiprotocol support into the heart of the system architecture.